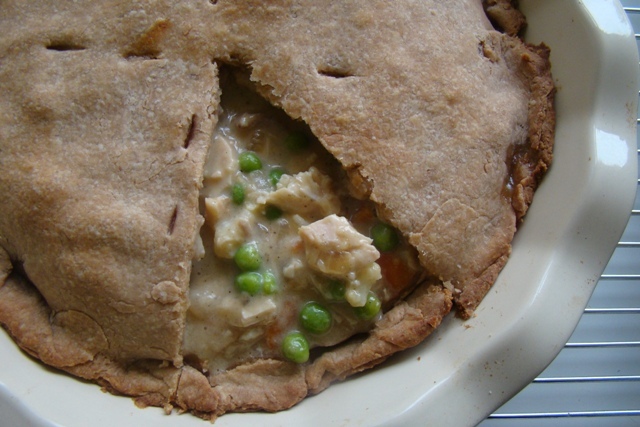 Chicken pot pie is comfort food. And they call it comfort food for a reason — you feel good when you eat it, at least temporarily. Unfortunately, the dish is typically packed with calories, fat, cholesterol, and sodium. Here we’ve given the American classic a healthful and delicious makeover with a whole wheat crust and a lightened, almost fat-free filling. But you’d never know the difference. 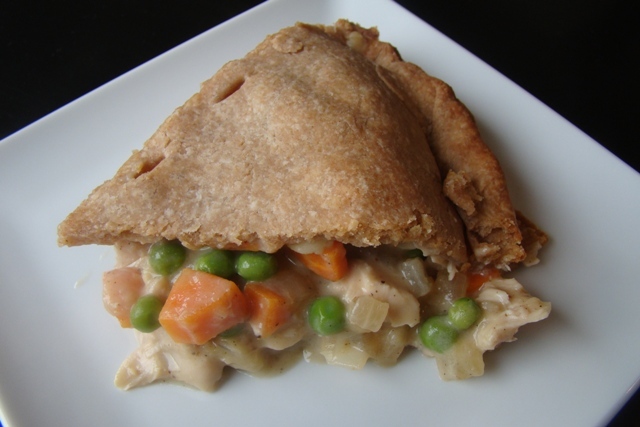 The filling for this pie is rich and creamy, with the consistency of a thick soup or hearty gravy. Subtly spiced with thyme and loaded with fresh vegetables, the chicken’s simple flavor shines through. And then the crust – soft, flaky, and nutty without any hint of heavy, grainy whole wheat. This recipe will keep you feeling your best and leave room for dessert! Make the pie dough (below) and let it chill in the refrigerator. Add a couple tablespoons olive oil to hot pan (or 1-2 tablespoonds of oil and butter, each). Saute onions until translucent. Add cauliflower, if using and cook for a few minutes. Then stir in peas and carrots. Add flour and cook for 30 seconds until well absorbed. Add liquids and whisk vigorously. Add additional broth if too thick. 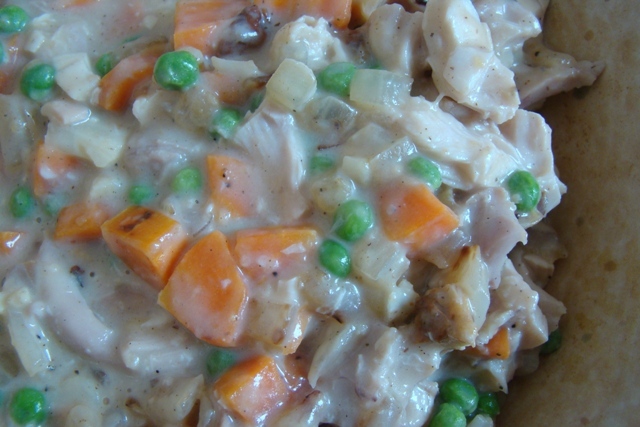 Mix in seasonings and shredded or cubed chicken. Cook until heated through. Pour into a bowl and reserve. Take chilled dough from the refrigerator and divide into two balls. 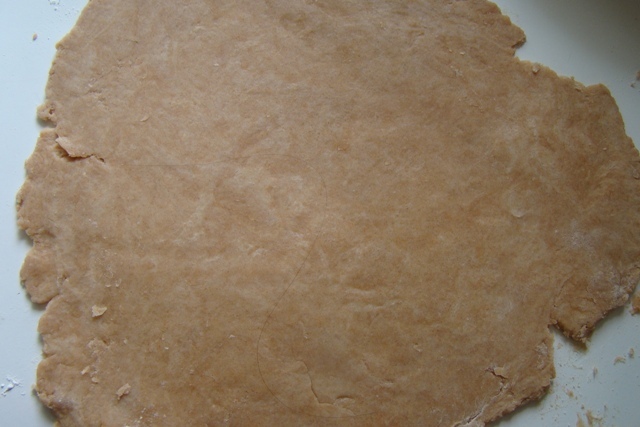 Foll on a lightly floured surface until both pieces are large enough to cover the top of the pie plate. Place one piece into a 9″ pie plate. Pour in cooled filling. Cover filling with second piece of pie, pressing it down around the edges of the pie plate and cutting 4-5 slits in the top to allow steam to escape. Bake for about 30-35 minutes, until filling is bubbly and the pie crust is golden. Let pie sit for about 5 minutes before serving. In large bowl, stir together flours, sugar, and salt. Cut in slices of butter using a pastry cutter (or fork, if you have to) until the largest pieces resemble peas. (Try to avoid using your hands. You want the butter to stay as cold as possible and your hands will warm it up and make the crust less flaky.) Pour the milk over the mixture, one tablespoon at a time, just until moistened enough to hold the dough together. Quickly form the crust into a ball. Refrigerate until ready to use. Hope you enjoy it as much as we do! Thanks for stopping by. Thanks for stopping by my site! I’m so glad to have found yours – it is wonderful! Keep up the great work!